*Please note that we inadvertently deleted our late morning update (posted at 10:54 am) while we were updating for the late afternoon. Last edited by Caribbean Traveler on Thu Sep 04, 2008 2:44 pm, edited 2 times in total. Recon, buoy, and ship reports indicate that Hanna is not changing in strength. It resembles a subtropical cyclone. Ship reports and buoy data indicate that seas are in the range of 10-20 feet east of the Bahamas into the northern Bahamas. Rough surf can be expected to continue in these areas into tomorrow. Also, high surf and strong rip currents can be expected on the Southeastern U.S. beaches. The last recon measured a 45 knot surface wind, with a pressure of 989 mb. Buoy and ship reports also suggest that this is very representative of the strength of Hanna at this time. Those reports were in the 30-40 mph range with stronger gusts. Our estimate is that Hanna is not 65 mph, probably more like 50 mph with higher gusts in the squalls in and east of the north eastern Bahamas. 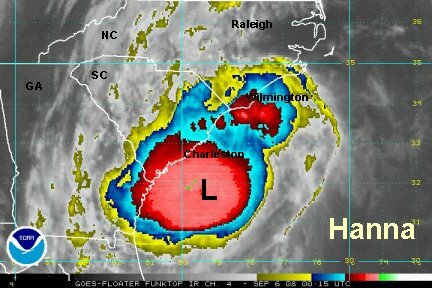 The forecast keeps Hanna going toward the Carolinas. Landfall is still predicted somewhere on the southeastern coast of North Carolina Friday Night around midnight. Some rain bands may reach the Carolinas by Thursday night. The weather will deteriorate during the day Friday. Hanna has a large circulation, so don't get too caught up in the exact landfall point. Right now the worst of the weather is on the west side of the center. 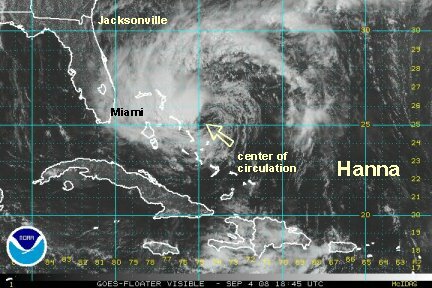 Hanna is now just southeast of the Abacos (northeast Bahamas) and moving northwest at around 14 mph. Nassau and Freeport have been reporting some gusty winds to around 30-35 mph. Some of these bands will move to the Florida coast this evening. 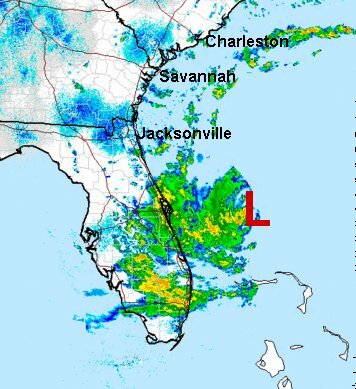 Expect rain, heavy at times on the east coast of Florida later this evening with some winds in the 30-40 mph range. It appears that the Space coast northward will see the bands moving in a little later with some of the gusts in the 30-45 mph range. The strongest winds are in the cluster just to the east of the Bahamas which may brush the Abacos in the next several hours. Several inches of rain are likely in the northern Bahamas with the more persistent bands. Most of the rain and gusty winds are on the west side of the circulation at this time, with one band well to the north. Right now we still think that Hanna has top sustained winds near 55 mph. We believe that the 65 mph estimate from NHC is too high. The last recon estimated a surface wind of 45 knots with a 989 pressure. The forecast models have not changed. Expect landfall near Cape Fear, N.C. around midnight or slightly after Friday night. Higher tides will near and to the right (east) of the landfall position. It looks like Hanna may ride along the coast of N.C. from Cape Fear to Cape Hatteras Friday night. At this time, it appears that Hanna will come in as a strong tropical storm or possibly minimal hurricane. Hanna will reemerge of of the Virginia Capes and move up the eastern seaboard. 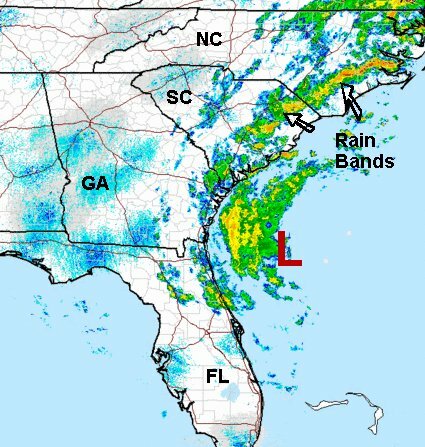 Expect heavy rain to move into eastern N.C. and S.C. then northward toward the Northeastern U.S..
A computer glitch erased our early AM update. We are sorry for the inconvenience. Last edited by Caribbean Traveler on Fri Sep 05, 2008 9:59 am, edited 2 times in total. We always say don't trust the models. They <b>will</b> be wrong, it just depends how much. 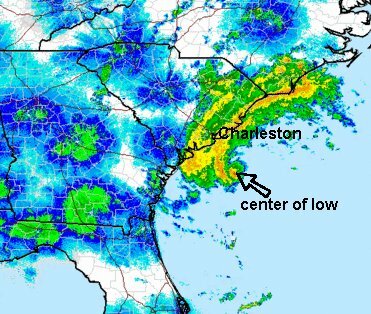 We'll after calling for a landfall in eastern N.C. for a couple of days, they have now decided that somewhere in between Hilton Head / Charleston will be the place. Even reliable models have missed the mark. It appears that the landfall will be a little later too. Probably in the middle of the night, after midnight. 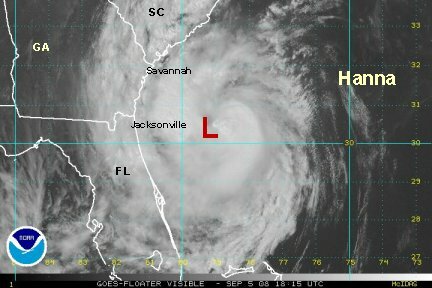 Hanna will be close to the northeast Florida and Georgia coast before moving into South Carolina. Because of this, heavy rain and gusty winds will pick up later today in those areas. We still think that Hanna will come in as a strong tropical storm or minimal hurricane. 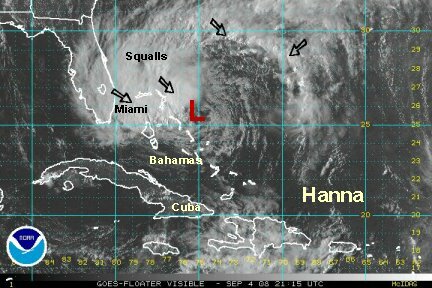 Hanna is strengthening....from our standpoint. Again, have have not believed that it has been a 65 mph tropical storm for a long time. Our best estimate is 60 mph at this time. The last Hurricane Hunter had a surface wind of 51 mph and stronger flight level winds. A buoy east of the Space coast of Florida had 27' seas and a 43 mph wind gust. East of Edisto, SC seas were 13' with a gust to 34 mph. Seas will be very rough on the northeast Florida coast, South Carolina and North Carolina coast. Afternoon recon shows that Hanna is moving nnw and should make landfall overnight on the middle South Carolina coast in the wee hours of the morning. It should come in officially as a minimal hurricane. We say officially because NHC has it at 70 mph at this time, and it should gain a little strength before landfall. 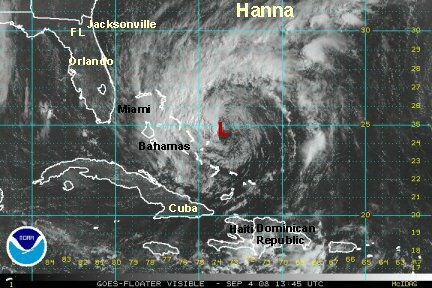 We believe, as over the past two days, that NHC has had Hanna too strong by about 10 mph. The latest recon about an hour ago showed a surface wind of 63 mph and a pressure that had risen to 984 mb. We think that Hanna is around 60-65 mph at this time and should strengthen some before landfall. We think 70-75 sustained at landfall with some higher gusts. Again, officially Hanna will probably come in at 75-80 mph. That's our guess what NHC will do. Heavy rain is moving into the Carolina's today and will spread northward into the Mid-Atlantic tonight and linger over the New England coast into early Sunday. Hanna should move fairly fast, which will limit rainfall amounts. Generally a 1-3" total will fall along its path with isolated 5" amounts. Hanna is on schedule to make landfall on the South Carolina coast after midnight. On it's present track it will make landfall somewhere between Charleston and Cape Romain. Top sustained winds are officially 70 mph. We are finally in agreement on the strength of Hanna. 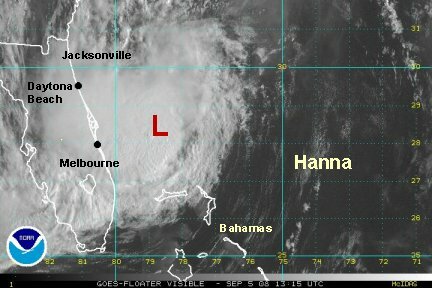 Hanna has been organizing all day and NHC has kept the surface wind speed at 70 mph. The recon finally confirmed this type of strength on the last pass about an hour and a half ago with a surface wind of 77 mph and a pressure of 981 mb. This is usually the threshold for hurricane strength, so we'll go with 75 mph, barely hurricane strength as it makes landfall. The track now takes Hanna inland where it will crawl up the east coast, near or barely onshore. It will move into the Mid-Atlantic during Saturday and move into New England by early Sunday. Rainfall will be in the 1-3" range along the path with isolated amounts of 5"+. Storm tides of 3-5 feet can be expected near the landfall location and northeastward. This does not count the much larger battering waves that will accompany the water rise. The eye of Hanna is just about to make landfall. The eyewall is just about touching Cape Romain now. With the concave shape of the coastline, Hanna may stay offshore for another two hours and finally come in near Myrtle beach. 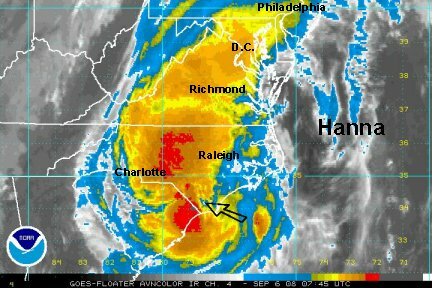 Hanna moved inland near the border of North and South Carolina at 3:20 am officially a strong tropical storm of 70 mph. 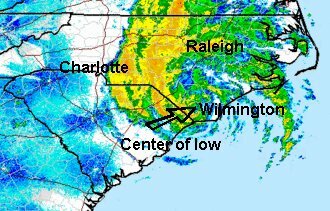 The eyewall touched Cape Roman, SC about three hours earlier and it looked like the center tried to move inland near Myrtle Beach. That was just a vorticy around the parent low. Rain and isolated tornadoes are now the main threat. The tornado threat extends along the coastal Mid-Atlantic Saturday. 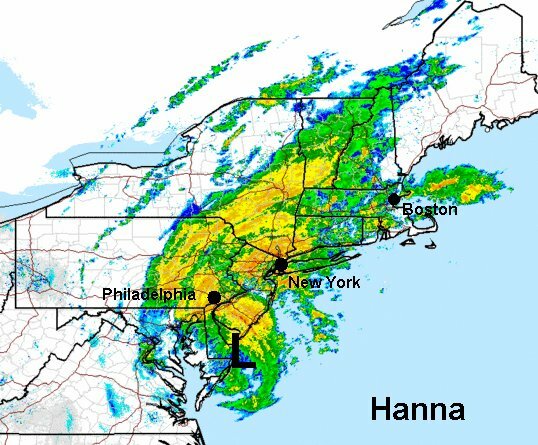 Heavy rain of 1-3" will fall along and to the west of the path of Hanna which will move from eastern N.C. to near the coast of the Mid-Atlantic Saturday then into New England Sunday. Expect isolated amount of 8"+. This rain is a true blessing in most cases. North Carolina for example has been very dry. The western part of the state picked up 12" of rain from Fay a few weeks ago. Now the central, and parts of the east will get heavy rain. The heaviest rain is in between Raleigh and Charlotte. Doppler radar has estimated 3-6" west of Raleigh and southward west of Lumberton and Fayetteville. Heavy rain is now falling in the lower Susquehanna Valley of southern Pennsylvania and continues south through the piedmont into southern Virginia. 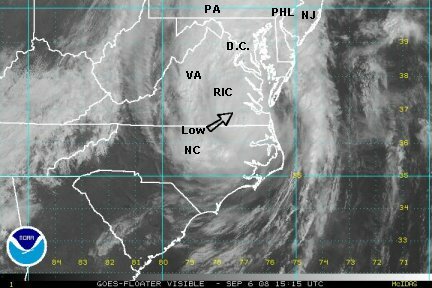 The center of Hanna is close to Petersburg, Va and is moving toward the lower Chesapeake. The low will move along the Mid-Atlantic coast later today and tonight and will move off of the coast of Maine during Sunday. The eventual destination looks to be north of the British Isles. Doppler radar shows a solid 3-6" amount from the piedmont of North Carolina into Virginia to near the Shenandoah Valley. Washington D.C. has and vicinity has had a range of 1-3" so far. The heavy rain will move into New York City later this afternoon then into southern New England a little later and over night tonight. It only takes about two feet of moving water to move a car. Don't drive through moving water! 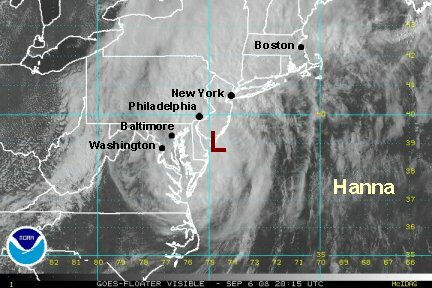 Hanna is now off of the Delaware coast, just south of Cape May, NJ. It is a fast moving, heavy rain storm at this point with some gusty winds. The heaviest rains are now falling in eastern Pennsylvania, New Jersey and southeastern New York. 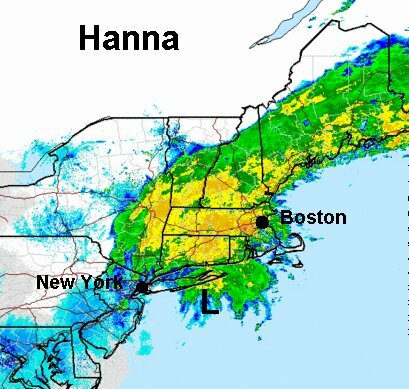 Rain is picking up in southern New England and will increase in intensity tonight. 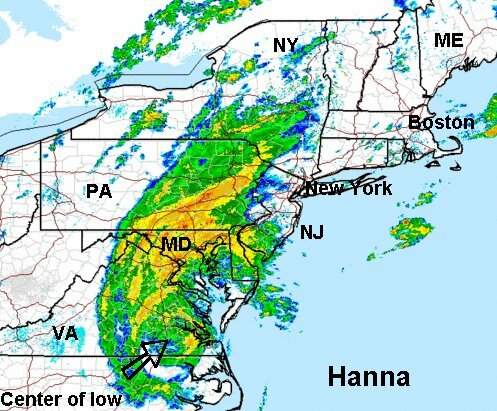 Doppler rainfall amounts in the Northeast now include a band of 3-5" near Washington, D.C., Baltimore, west of Philadelphia and New York City. There are some 1-3" totals south of Boston to near New York City. 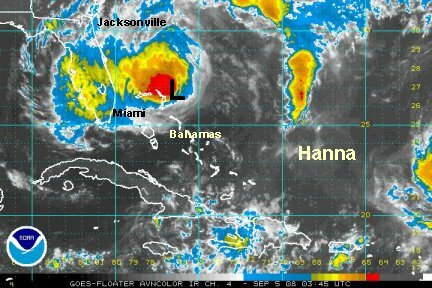 Hanna continues to rapidly move northeast. NHC upped the winds to 60 mph at the 8 pm advisory. Rain is ending in New York City, but continues northeast across most of New England. Sideswiped 1.5-4" rain totals are estimated on the Doppler radar across New England. 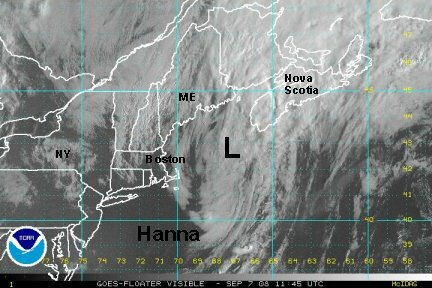 Hanna will be moving along the southeastern Canada coast during the day Sunday. Hanna's story is coming to an end for the U.S. It is off of the New England coast and will be south of Nova Scotia, Canada by this afternoon. 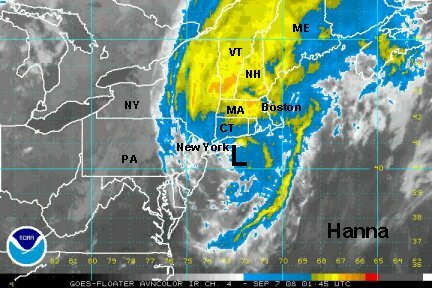 Hanna's main effect on the U.S. was heavy rainfall. In cases farther south, it was welcomed rain. There was a band of 3-5" of rain from South Carolina into New England with locally higher amounts. Hanna, has become extratropical. There will no more updates on Hanna.